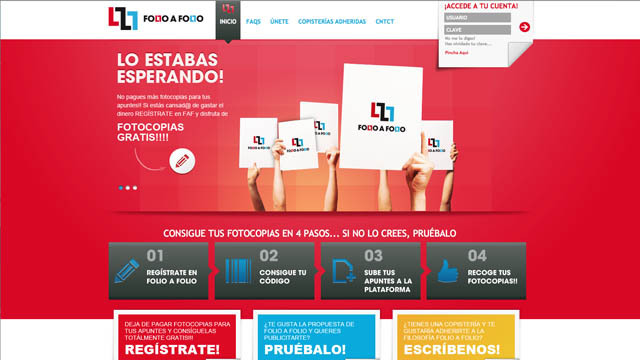 Folio a Folio is a very interesting web project. A brilliant idea that is to print advertising photocopies through manipulating PDF files. It was a very complex project, because the algorithm to account for advertising available in the system required statistical formulas and concurrent access to large volumes of data in real time. In addition, the administration area management has a fairly complete user profiles, so each profile had permission to access various system functions. The administrator can control and create users for other roles, and controls all data flow, billing and revenue and real-time monitoring system behavior through various graphs that visually represent the evolution of users. The other roles are very importante too. Advertisers, who buy ad campaigns, with a complete tracking system to know in real time the sheets printed with their images and ability to buy more campaigns using paypal payment or making bank transfer. They have a wizard to create campaigns easily and a preview system that emulates the final appearance of advertising in sheets. Vendors, whose function is to sell advertising and attract new customers. This role also has an extensive track campaigns sold and a check-in area to receive relevant committees. This role can create campaigns too, using the same system than advertisers. End users, who upload their documents to the platform and our algorithm is responsible for selecting the relevant advertising and transform the documents, resulting in the new document with embedded advertising. Then the system tells the user the contracted establishment where he can collect his copy from. Copy shop establishments, that connect the system to see what documents need to be printed and delivered to end users previously identified. Each sheet printed reports a commission, which can be confirmed through it’s user area. I personally participated in the design of the project and I defined its architecture and features. The database would undoubtedly have to be consistent so that access was fast and easy. I also was in charge of making the customer specifications, with regular meetings of project monitoring. I was also responsible for leading the team, composed of programmers and designers. This project was completely developed in PHP, jQuery and HTML, using MySQL for database.